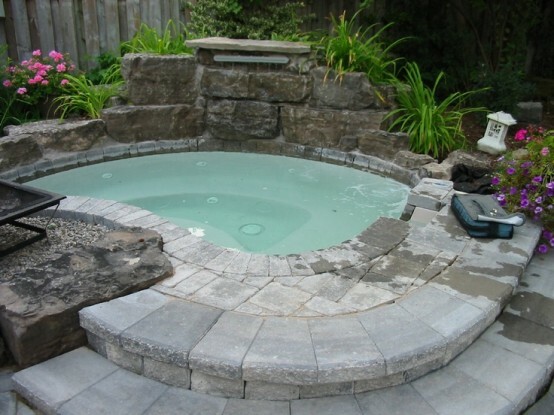 Hot tub landscaping is a next must-do thing after you just have purchased a hot tub to install in your outdoor living place. 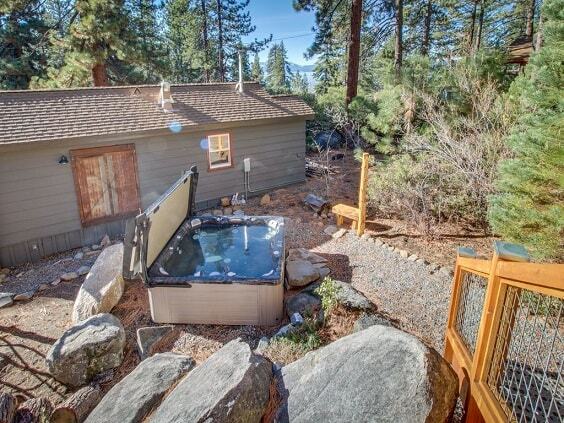 You can’t just directly put your hot tub in your backyard without adding some beautiful decoration around the area. Decorating the hot tub area with a pathway, wood or rocky base, plantations are some ways that you can try to make it look and feel more inviting. 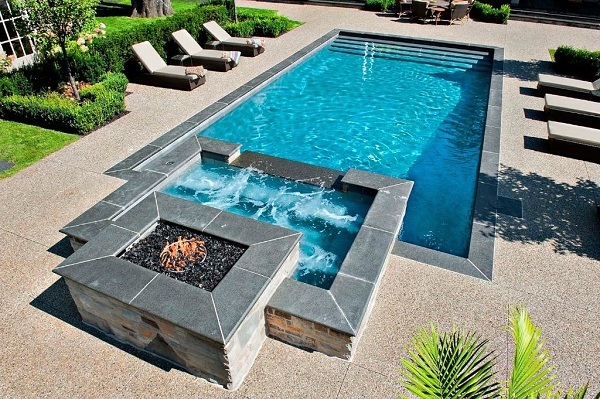 Then, combining the hot tub with other relaxing facilities like loungers, the firepit is always the considerable idea to complete the enjoyment. 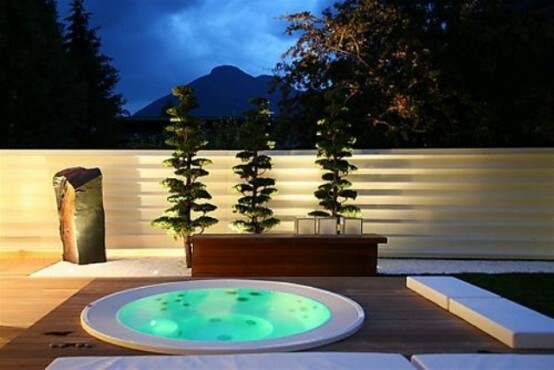 Well here, we have picked some best hot tub landscaping ideas that will definitely inspire you. 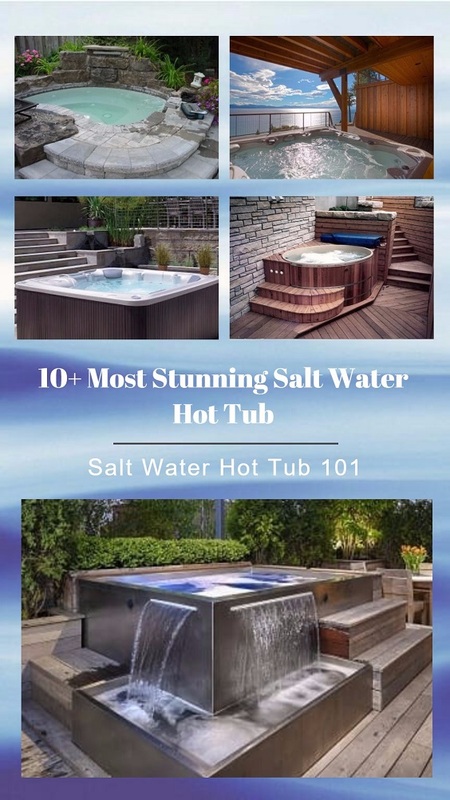 They are totally worth to be your ultimate reference when you are about to enhance the beauty and comfort of your beloved hot tub. 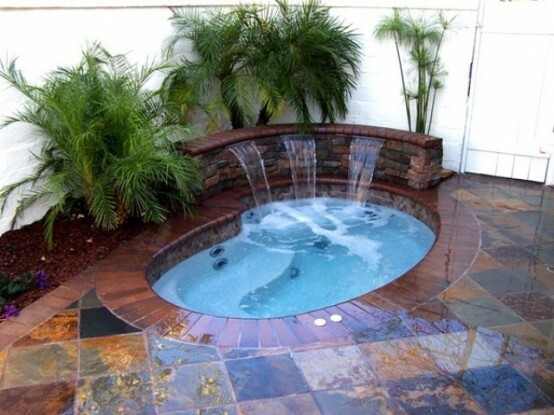 So let’ just keep scrolling to check our best picks of hot tub landscaping ideas! 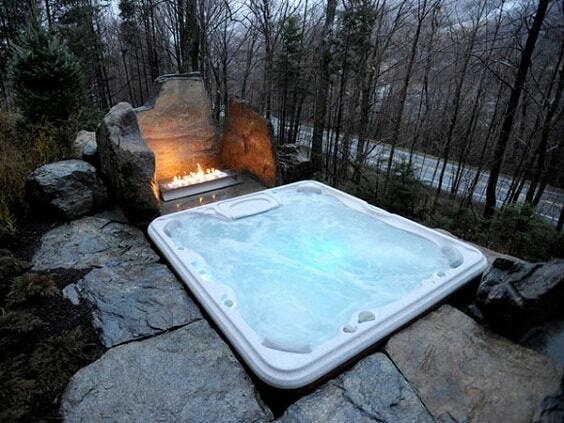 A stunningly natural hot tub landscaping with rocks as its main material which surrounds the hot tub with wood frame. area. Then, some plantations complete the layout beautifully to give a more colorful touch. Adding a rustic look to your backyard is always a great idea since it flows well with the outdoor surrounding. 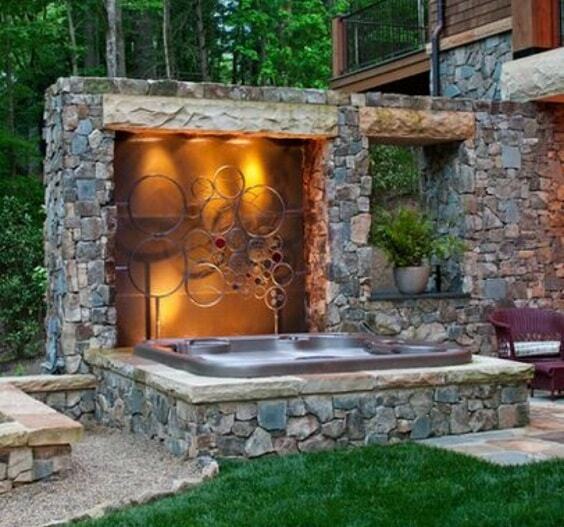 This hot tub landscaping shows a beautiful rustic construction which is used to case a 6-person square hot tub. Using a natural material for a modern-designed landscaping can be a good idea to create a beautiful layout. Here, the simple minimalist layout which is made of wood look so inspiring to copy. If you want to make your natural hot tub landscaping look way more attractive day and night, installing some lights is the great option to try. You can place the lights in some hidden spots to make a more distinctive look. The cozy hot tub landscaping with the extra sitting area which will be a superb lounge to enjoy every summer. You can see how the accessories look beautifully match the overall look of this layout. 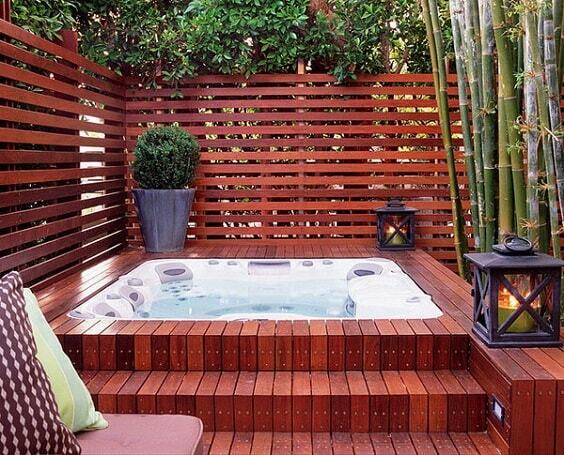 Here, the hot tub is installed in the wood area complete the sitting spots which look gorgeously comforting. The wood area itself is placed on the paved area with the grass accents, creating a beautiful combination. 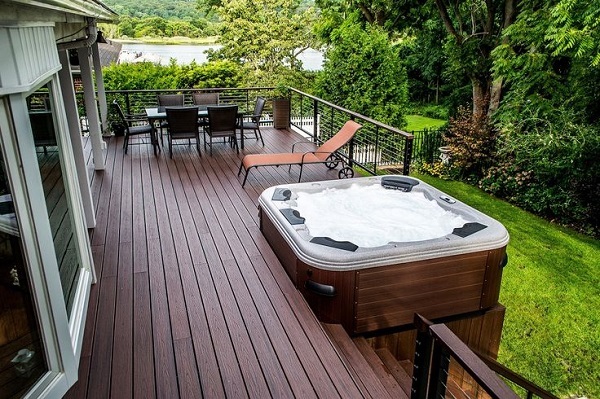 This one is a great inspiration for you have a round hot tub with its unique half-circular deck. 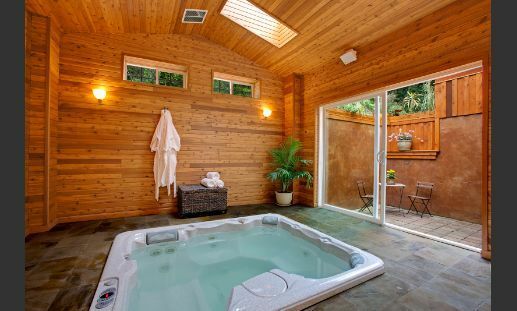 It enhances the beauty of the hot tub while also provides a cozy area to chill off. 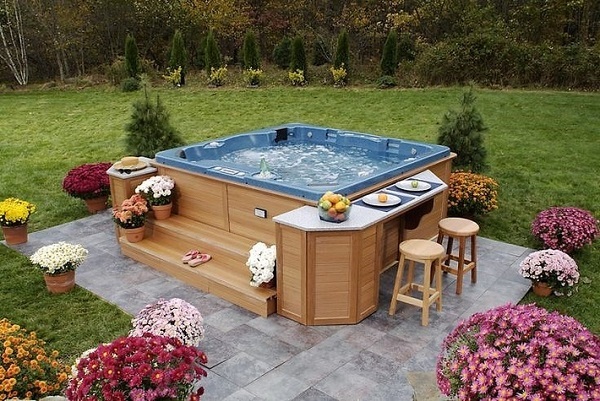 An admirable and comfortable hot tub landscaping which will allow you to enjoy it in any weather conditions. The shade is all made of wood with the sand-colored fabric to match and colorized by some greeneries beautifully. The wonderful hot tub landscaping which uses wood as its main material, and perfects to give your outdoor living space a superb focal point. 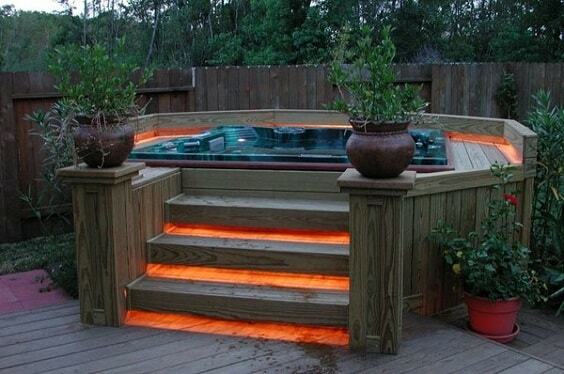 It’ designed to provide the great privacy when you enjoy your hot tub in a very beautiful way. 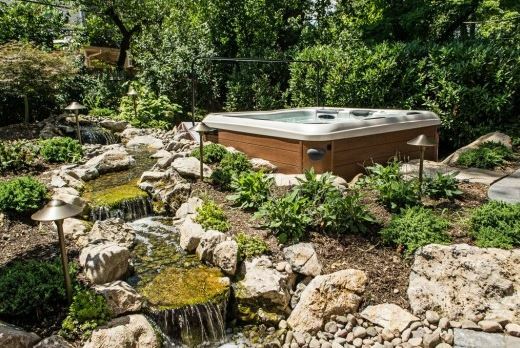 The design of this hot tub landscaping will provide a superbly exhilarating spot to relax and have one with your family and friend. Surrounded by the rocky bar, you can hold an enjoyable hot tub party every single day. It’s the simple hot tub landscaping which works well for you who have a narrows space in your outdoor living space. The tub is installed in an in-ground style with the wooden frame which is designed in an Asian-style sitting area. A firepit is always a considerable addition to complete a hot tub landscaping which will enhance its beauty and function at the same time. 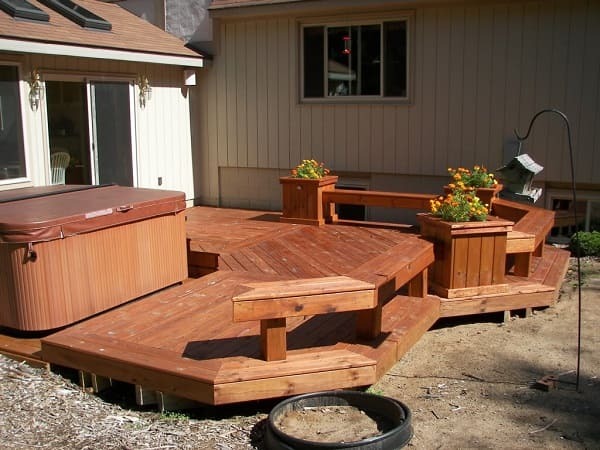 It will give a more comfortable atmosphere which makes your hot tub area look and feel more inviting. A unique hot tub landscaping with the stunning design that will bring the style of your outdoor space to a whole new level. 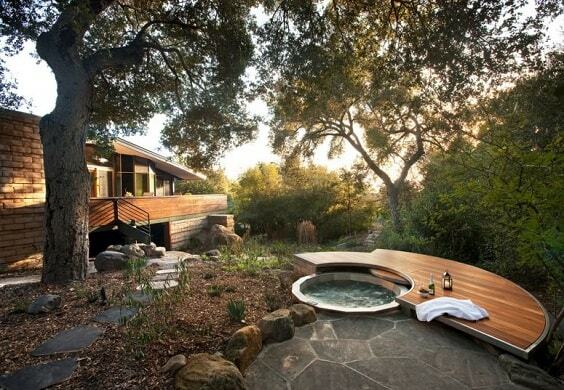 The round hot tub is installed in the center of a contemporary-style construction which is made of wood and concrete. 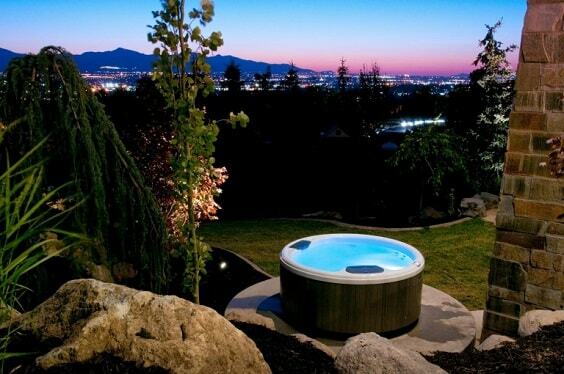 This hot tub landscaping may look simple with its round rock base, but it directly faces the amazing view. It can be a nice option for you who live in a highland area. The beautiful hit tub landscaping which uses rock as its main material for you who love something naturally rustic. Here, a curvy tub is fully surrounded by the construction which fits the tub itself. To add a more joyful nuance, the fountain and greeneries are placed beautifully. A backyard with the tropical layout is always one of the best choices when you want to have a fresh atmosphere during the summer. 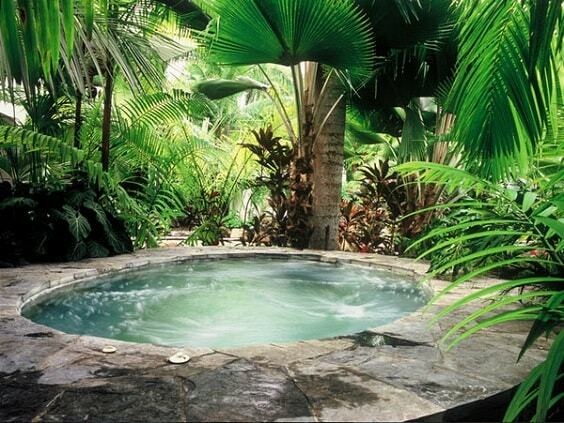 In this hot tub landscaping, the tub is surrounded by the rocky construction and some tropical trees. You can see how the color of the rock frame and tropical trees create a contrasting look stunningly. It has been the popular option to install a hot tub next to the patio area to provide a superb pleasure in your outdoor space. 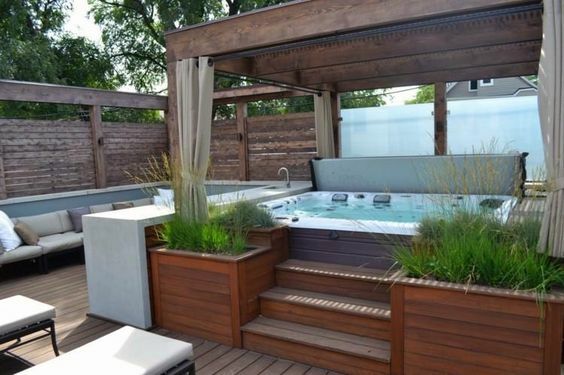 Here, a small rounded hot tub is placed in the center of a wooden construction which matches the overall look of the patio gorgeously. 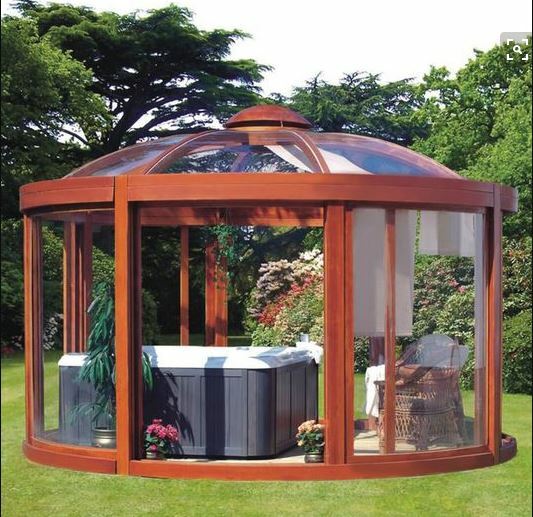 A hot tub gazebo or hot tub enclosure is the best choice when it comes to protecting the tub in any weather conditions. Besides giving you the great comfort to enjoy the tub during the summer days, a hot tub gazebo will also protect it in the winter. 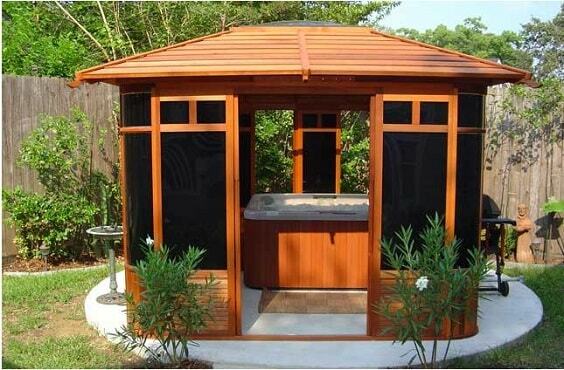 You can purchase a hot tub enclosure kit or the custom made to have kind of his hot tub landscaping in your backyard. 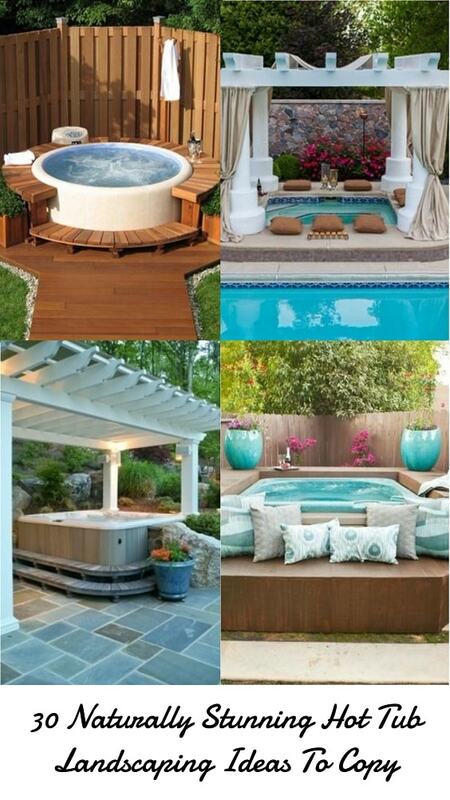 The rustic yet colorful hot tub landscaping which uses marble tile in different shades as its flooring materials. It creates a catchy focal point especially since it’s built next to the white fence. 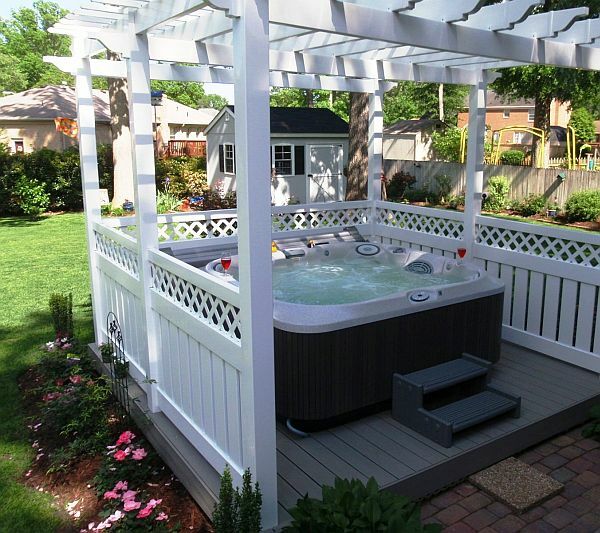 Shading a hot tub can always be a good way of landscaping since it adds comfort and styles up your hot tub perfectly. You can install a small pergola which is enough to shade a tub. Adding some linens and building a mini sitting area can be a considerable idea to keep in mind. If you are kind of handy DIYers, you can build your own gazebo by using some woods. 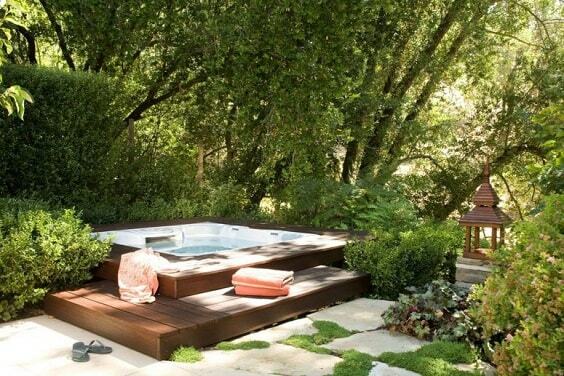 This hot tub landscaping can be a great inspiration to try with its simple yet beautiful design. The gazebo is built with the lattice-style frame and pergola shade and gorgeously finished in white. 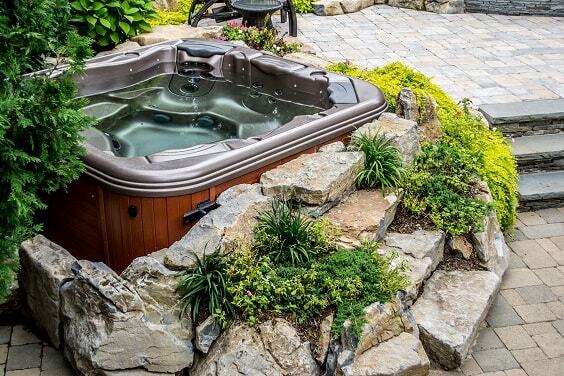 For sure, this hot tub landscaping will be the major focal point of your outdoor living space. 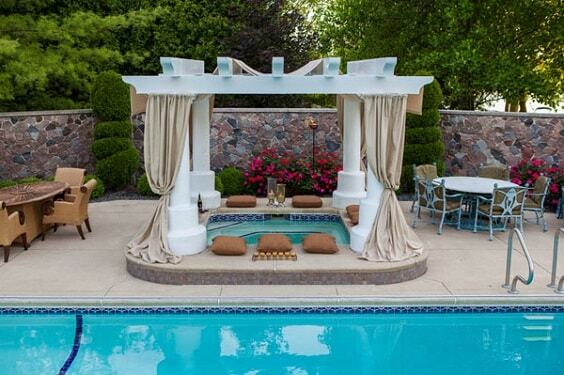 The awesome hot tub gazebo in Asian style to add another touch to your backyard. Its construction is mostly made of wood which flows really well with the outdoor surrounding. 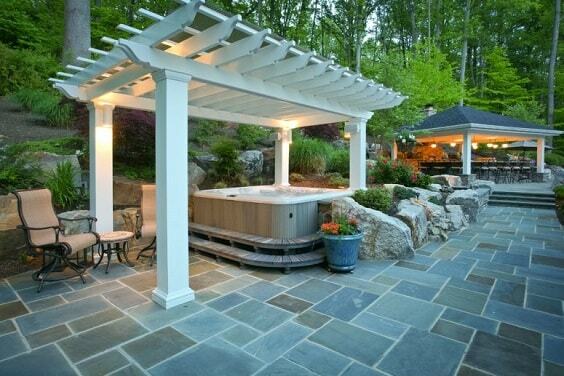 The fantastic hot tub landscaping with the huge pergola shade and rocks as its decorative element. You can see that the pergola and rocks are finished in white to complement a light wood frame of the hot tub beautifully. Also, notice that the fiberglass sheet completes the pergola to provide a much cozier shade. 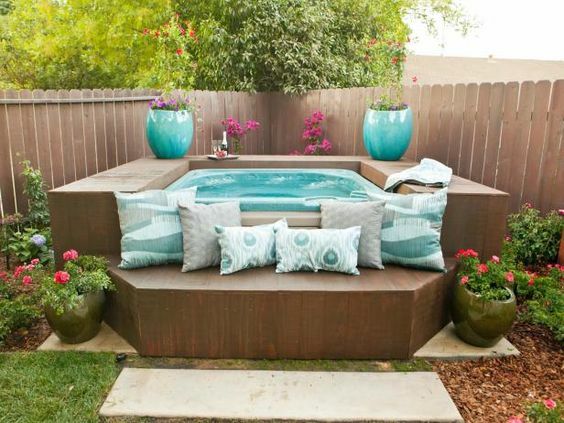 Decorating your hot tub area with a surprising decor item is a good idea to try, and this hot tub landscaping is worth to include on your inspiration list. Here, a work of art which is made of steel becomes the central attention of the area. The art piece surely styles up the yard and make it look distinctively attractive. 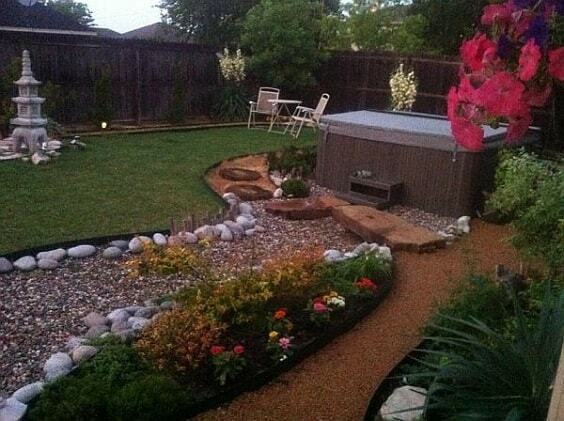 The naturally beautiful hot tub landscaping with the combination of sandy look and some gravels. Such combination creates a very inviting atmosphere which is so irresistible to enjoy. A long-tiered fountain (which resembles a river), greeneries, gravels, rocks, and, of course, a hot tub of this yard is so superb. 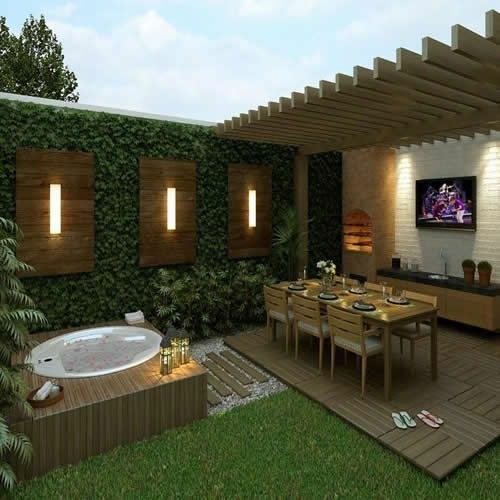 All of those elements create a very admirable layout which will make your outdoor living space become a heaven on earth. 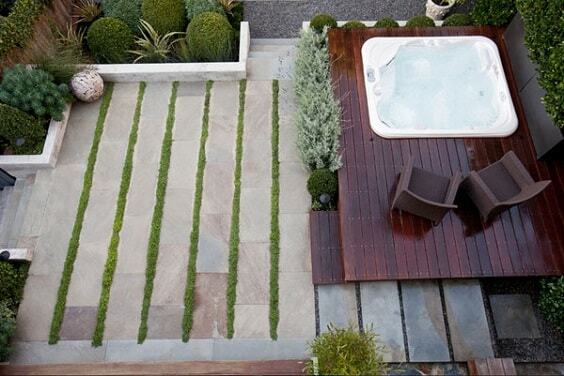 The long pathway which contains some gravels, rocks, and greeneries is the focal point of this hot tub landscaping. Its materials combination fits well with the backyard environment. 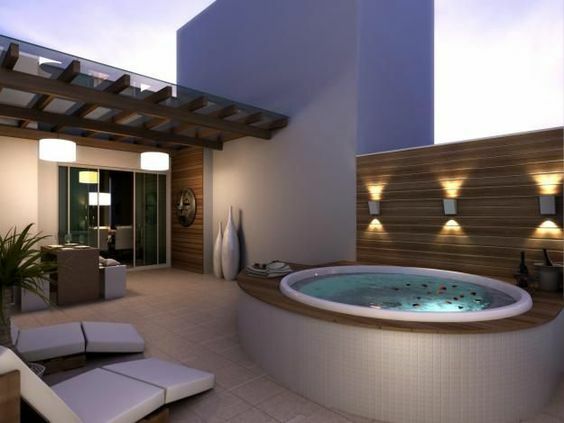 Eventually, those are some awesome hot tub landscaping ideas that can be an ultimate reference when you are about to give some improvements to your outdoor space. 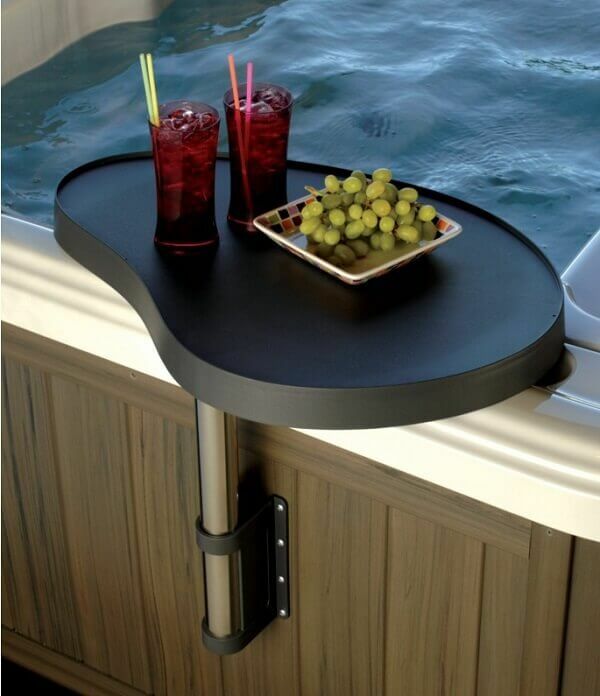 They will never fail to style up your hot tub and also enhance its comfort. 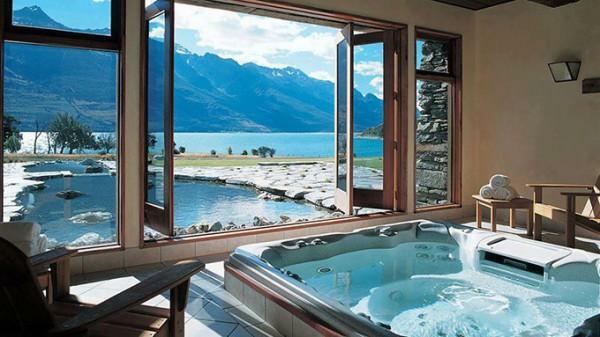 Buying a hot tub is always a great investment that you can consider. 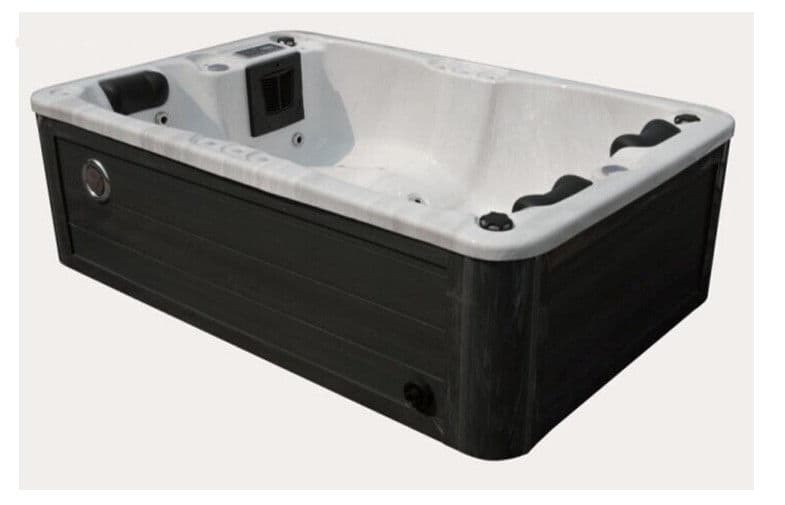 Today, the hot tub is widely available to purchase in the various price range, feature and design, so you can easily choose the one which suits your needs and budget. In addition, there are five keys that you can consider in building a hot tub landscaping, below are he brief explanations. 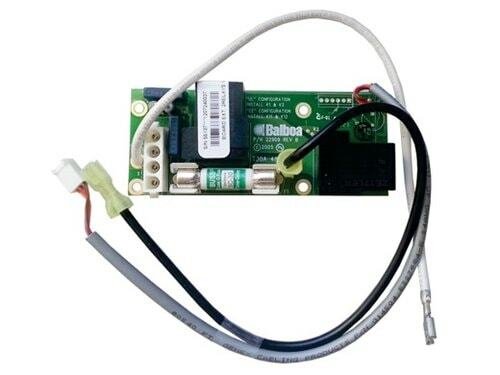 Main Purpose – The first thing is you have to decide how you will use the tub itself. Whether it’s just for personal enjoyment or a party spot. 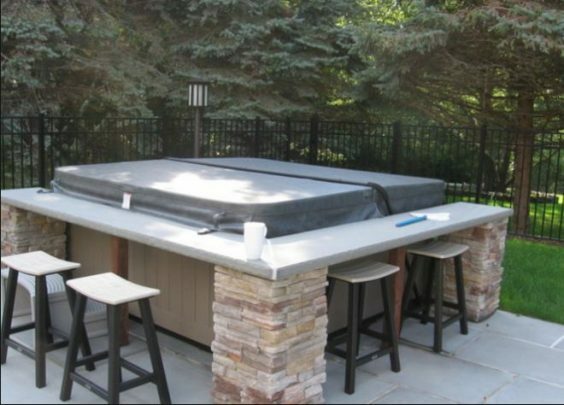 Determine the Location – Of course, you have to choose the best location to install your hot tub in your outdoor living space. Start by measuring the area, examining the view, and safety. 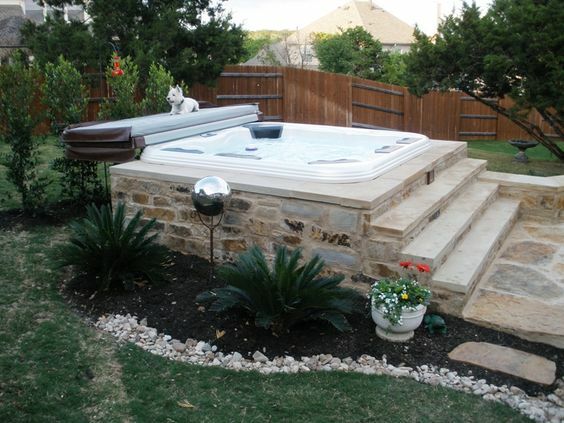 Create a Privacy – It’s kind of essential elements of a hot tub landscaping to provide the great comfort for everyone. Consider a Shade – Yeap, shading a pergola is always an alternative option that you have to think about. Use Natural Elements – It’s not necessary, but some greeneries or rocks around your hot tub landscaping will create a nice harmonious look in your outdoor space. Well then, happy landscaping your very own hot tub!